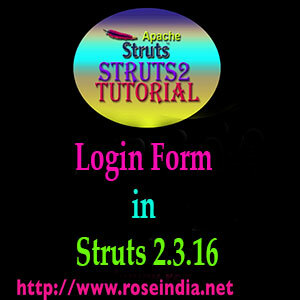 In this section we will explain you how to create login form in Struts 2 version 2.3.16. We have used the hard coded values to validate the user. How to create Login Form in Struts2? In this video tutorial I am explaining you about the source code of the program to create the Login form in Struts2 framework. The Struts2 version 2.3.16 and Eclipse based Maven tool is used for this project. In this project you will also learn how to use the Maven plugin of the Eclipse. We have used the Eclipse Lunar IDE for this project as it support the Maven tool. If you don't know how to use the Eclipse Lunar IDE, then check the tutorial Download Eclipse with Maven Plugin support. This application presents a login form to the user and asks the user to enter "User Name" and "Password". There is button "Login" to login to the system. When user enters the invalid user name and password and presses the login button, application displays the error message. When user enters "Admin" and "Admin" both in the user name and password fields and presses the "Login" button, Login success screen is displayed. This application is build using the Struts 2.3.16 and uses the Eclipse IDE to build the project. Applications can be run on the Tomcat server from the Eclipse IDE. Check the tutorial Tomcat 7 in Eclipse Helios for more details on running applications from Eclipse on the Tomcat Server. In the above video you will find all the steps necessary to create the login form in Struts 2. This application is not validated against database, but you can easily add the database validation code. Apache Struts 2 is the famous MVC framework and it is used by the developers to write enterprise applications for their clients. Login and user management is the main requirement of any enterprise application. Here you will learn how to make simple login screen and add validation code for validating the user. You can run the application in the Tomcat it self. Check the above video for the complete details. Download the source code of the Struts 2 Login form. Let's understand the code of the application. We have used the Struts 2 version 2.3.16.3, which is the latest version of Struts 2 at the time of writing of this tutorial. The action class contains the code to be executed when a particular action is called. In our example execute() of the Login.java class is executed. This class contains two variables username and password for receiving the values entered by user. In the above action class the execute() is used to validate the user. Here you can add the database code for validating the user against database. The code <action name="doLogin" class="net.roseindia.Login"> is used to configure the action to handle the "doLogin" request. The JSP form file is used to generate the login form and during the login validation if any error comes is also displays the error message. So, today you learned at roseindia.net how to make a login form in Struts2. Check more Struts 2 tutorials.